Celebrate spring with a unique gift for your friends and neighbors! It's time to say goodbye to winter, and hello to spring! Celebrate the time of blossoming and renewal with a special, limited time only friendship gift in the friendship store. 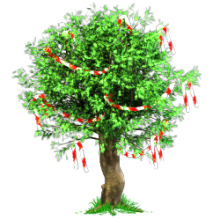 The "Merry Spring Greeting" (a tree with red-and-white ribbons) is only available from April 1-30, for the low price of just 3 Gems!.